A British nurse that was diagnosed with Ebola last week is said to be in a critical condition at the Royal Free Hospital London. Pauline Cafferkey arrived back in the UK on the 30 December from Sierra Leone where she had been volunteering with the charity Save the Children. A spokesperson for the hospital said it was “sorry to announce that the condition of Pauline Cafferkey has gradually deteriorated over the past two days”. The nurse was placed in an isolation unit at Glasgow’s Gartnavel Hospital before being transferred by RAF Hercules plane to the London hospital. Cafferkey is being treated with an undisclosed experimental anti-viral drug and blood plasma from a survivor of the disease. This is the second UK case of Ebola confirmed after volunteer nurse William Pooley contracted the virus back in August. Also treated at the Royal Free Hospital, Pooley then recovered in November after being cured with ZMapp – of which there are no stocks left – a medicine manufactured by San Diego-based biotech firm Mapp. In December it was announced that a Phase I trial had highlighted that Ebola and Marburg vaccines generated a comparable response in tests involving Ugandan and American volunteers. 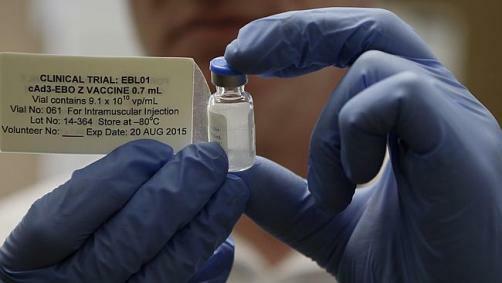 Lead researcher Dr Julie Ledgerwood said at the time: "This is the first study to show comparable safety and immune response of an experimental Ebola vaccine in an African population. “This is particularly encouraging because those at greatest risk of Ebola live primarily in Africa and diminished vaccine protection in African populations has been seen for other diseases." Developed by NIAID, the institute is also researching a more commanding version of the vaccine with GlaxoSmithKline. The pharma firm’s development was further boosted in December after a newly-formed $18 million-backed consortium was put forward by the European Commission. An additional $1.7 million from the Swiss government was also handed to the company which is already helping to initiate Phase I trials in Switzerland. The funding will also assist the UK pharma firm to begin larger later-stage trials in parts of Africa. A handful of other companies will be hoping to be able to offer Ebola therapies in 2015 that include Takeda and Merck, plus Johnson and Johnson. Only weeks ago, the global vaccines alliance Gavi pledged $300 million to purchase any WHO-recommended vaccines for affected countries. The virus has killed more than 7,800 people since last year, almost all in West Africa. The WHO says the number of people infected by the disease in Sierra Leone, Liberia and Guinea has now passed 20,000.